McIntosh processors help ensure consistently high quality sound reproduction in almost any listening room. Our processors contain powerful computers to analyze and compensate for your room acoustics and audio speaker placement to deliver a studio-quality movie and music listening experience in your home. A processor should have the flexibility to connect all your components together, process the signal into a great room-filling home theater experience, be easy to use, and deliver premium sound. McIntosh processors deliver all this, and more. The A/V processor that you've always dreamed about has finally arrived! Introducing the McIntosh MX-121 Audio/Video preamplifier! One of the most anticipated products that McIntosh has produced in quite some time is a processor that continues in the McIntosh fields of excellence while offering 21 century features and enhancements. The McIntosh MX-121 is packed full of new and exciting features, such as, six HDMI 1.4 inputs that will allow you to pass thru 3D video content, and Ethernet input connectivity that allows you to not only to listen to Internet radio and Pandora, but also offers Apple Airplay to easily play all of your favorite music stored on your computer. You can even control and view the status of the MX-121 with your Apple i-phone or i-pad! The sound of the McIntosh MX-121 is astonishing; with the latest Dolby Tru-HD and DTS-HD sound processing for all of your favorite movies and music. The MX-121 offers the sophisticated Audssey Multi-EQ XT acoustic room correction, and three zones for whole-home audio distribution, and nine inputs are some of the many features found on the MX-121. 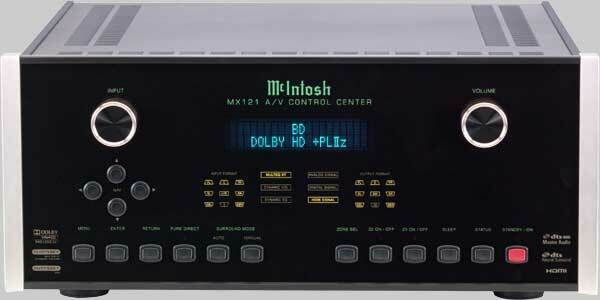 The McIntosh MX-121 Audio/Video processor is currently on display in our home theater, and we are truly amazed with not only its sound quality, but also its ease of use. Our first customers that have purchased the MX-121 are really taking to it, and enjoying its sound quality, as well as, Internet radio and Apple Airplay. A flexible yet purist design that maintains the highest quality two channel audio performance. McIntosh's many years expertise in tube design and newly developed control circuits. It has all the flexibility modern systems require while maintaining the highest quality two channel performance. As an example, all signal switching is done inside glass cylinders filled with inert gas. These switches are located adjacent to the input/output jacks, virtually eliminating crosstalk. Switch cleaning is a thing of the past. Particular attention has been paid to the MM Phono Input. Its innovative circuit incorporates time-proven 12AX7 vacuum tubes. The brilliance of its design is reflected in both its simplicity and superior performance. Electronic, independent adjustment level settings for each of the eight source inputs from either the front panel or remote control. Channel Balance is electronically adjusted and stored in memory. Bass and Treble controls are included and will prove invaluable for older recordings or may be bypassed when not needed.